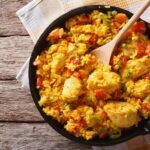 A traditional Rice and Chicken Recipe from Puerto Rico – Arroz con Pollo. This is a guest post written by Monica Henin from Addon Kitchen. I hope you will enjoy it, it sounds delicious! Chicken recipes always intrigue foodies because if cooked properly, then there is nothing that is as good as a chicken dish. Today, we are going to discuss one amazing chicken recipe that is coming straight from the Americas. The name of the dish is Arroz con Pollo, which a traditional Puerto Rican dish that is made with chicken and rice. I really love this dish because it has got some of the most amazing flavors that one could ever taste. Puerto Rico is one of those regions where food is taken quite seriously. People are passionate about what they eat and drink, so anyone who would go there is going to get mesmerized by the kind of variety and flavours that Puerto Rico has in the offing. This chicken and rice is a prime example of the amazing Puerto Rican culture. 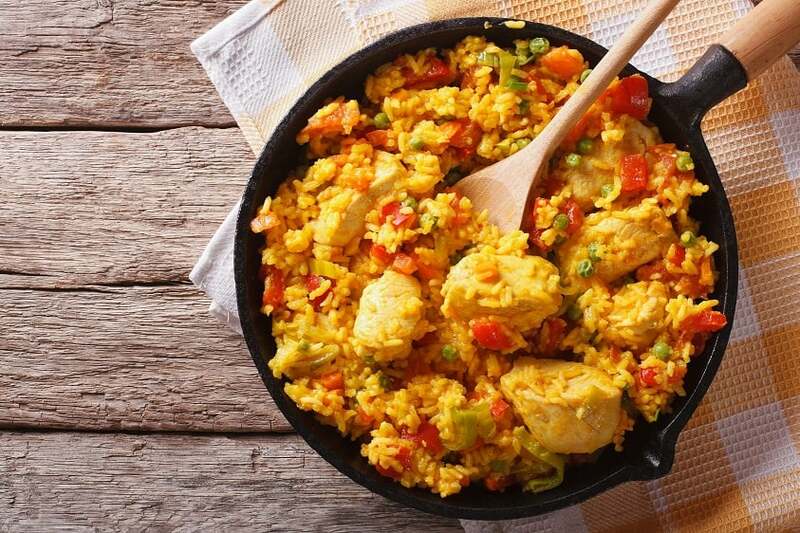 It is not like the ‘chicken biryani’, a popular dish from the sub-continent, but Arroz Con Pollo has its own unique identity and history, which is what makes it a sublime dish. Author Bio: Monica Henin, the author of this blog post is a passionate food lover and a reputed blogger. She has an in-depth knowledge in the field of food, especially healthy recipes and food tips. Check out more of her work at www.addonkitchen.com, which is a highly reputed website for knowing about kitchen essentials and unique recipes. 2 lbs/ 1kg chicken thighs or legs. 2 cups/ 500 g uncooked rice. ¼ cup green olives (sliced using Chicago knife). ½ cup/ 125 ml Puerto Rican Sofrito. 1 small white onion (diced). 12 oz. / 340 g tomato sauce. 4 cups/ 1 liter water. Take a large iron skillet or a Dutch oven and place it on top of the stove. Put some oil in the skillet or oven and heat it over moderately high heat. Season the chicken thighs or legs with salt and pepper, and cook until all sides of the chicken turn brown. It will take around five minutes. Take the chicken out of the skillet/oven and keep it aside. Reduce the heat on the skillet or oven and add onion into it. Fry onion for three minutes or until it becomes soft and translucent. After that, add sofrito, capers, olives and tomato sauce into the skillet/oven for 5 minutes. After that, add rice and browned chicken into the pan with 4 cups of water. Increase the heat a bit and bring the water to a gentle boil. You will have to cook without putting the lid on the skillet/oven because this will absorb most of the water. It will take around 25 minutes to absorb the water. Now, you will have to gently stir the rice. You can cover the skillet/oven and cook the rice on low heat for 20 minutes. Once the rice is cooked, then you can remove the skillet/oven from the heat and serve the dish to your family or friends. I have no doubt about the taste of this dish. Your family members or friends will love this dish and will ask for more and more. So, don’t wait any longer and try this Central American dish. It is recommended to add bone-in chicken instead of boneless, as this would add a lot of flavor to this traditional rice dish. This rice and chicken looks so delish and comfy. This would make a great weeknight meal. This sounds wonderful – I bet the chicken is so tender. Arroz Con Pollo is definitely our family’s favorite. I used annatto seeds for the orange color. I love how your rice has that orange color too without having to use the seeds. Must be the tomatoes?